In 1982 Sweet was, to put it bluntly, “Resting”. Steve was now spending all of his time in New York and really did not want to be in England and Mick was coming to terms with life after the death of his first wife, Pauline. I was doing what I had always done, working as a producer, writing songs and playing and singing on other artists recordings. Louis Austin, Sweet’s engineer from way back to “Fox on the Run” in 1974, suddenly called me to tell me about his latest project, a mobile recording studio. Fleetwood Mobile, as it became known, was now home to the accidently revived Andy Scott solo project. Initially we needed to road test the gear and as such needed a song to record. 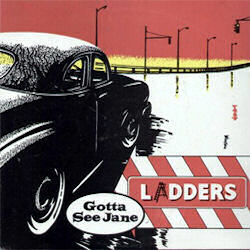 During a late night chat “Gotta See Jane” popped up as one of those songs that had never been covered. It was the early 80s, Linn drum, synthesizers and primitive synchronization was a battle but once we had solved the stereo windscreen wiper effect things moved on quickly. The mobile was alongside the barn of a tudor house in the outer stockbroker belt in Surrey. There was a long straight section of road near the front gate and to get the song started we needed the sound of a car skidding with tyre squeal. I had an Aston Martin DB6 but could not get the desired effect so the sound that is heard on the recording is actually Louis’ Scimitar, much to my chagrin. All things considered the recording of”Jane” started life as a trial run for the mobile but turned into a brilliant piece of 1980s kitsch. The UK arm of Tamla Motown, Jobete seemed the obvious place to get the ball rolling. R Dean Taylor, the singer/composer of “Gotta See Jane”, was the only white artist signed to Motown at that time and in my wisdom I arranged a meet with MD, Ivan Chandler. This was to prove fruitful though Motown UK were not signing anyone he knew of a new label, Statik Records, who were looking for someone just like me. Laurie Dunn, one of Richard Branson’s team at Virgin, was to become my friend and mentor for the next couple of years. “Jane” was eventually released on Statik [no 002] under the pseudonym “Ladders” [this was reference to John Lennon who when asked what he would do after the Beatles, he joked that he would call his band “The Ladders”]. When the matter of a B-Side for “Jane” was discussed, I had met and started working with a talented singer/songwriter, Chris Bradford. One of the songs we had written was “Krugerrands”. A rather sarcastic anthem of its time. The lack of time and budget necessitated that my home demo was deemed good enough for the job in hand. Therefore there are two versions of this song, this one stripped down to the bone [recorded at my flat in St Johns Wood] and the next A-Side single version being my original demo with extra dubs and a much fuller sound production [48 track recorded at the Townhouse, London].